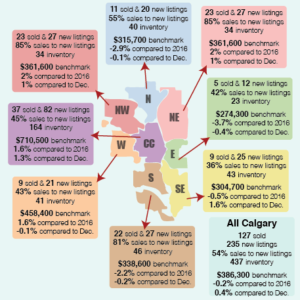 City of Calgary, March 1, 2019 – The effects of Calgary’s economic climate continue to create weak sales activity and elevated inventory in the city’s housing market. As a result, prices are being affected. “It is not a surprise that slowing activity in the housing market has persisted into February,” said CREB chief economist Ann-Marie Lurie. As of February, citywide benchmark prices were $414,400. This is nearly five per cent below last February, slightly lower than last month’s figures and over 10 per cent below highs recorded in 2014. While the market remains oversupplied, slower sales and price declines do appear to be influencing sellers.